What happens when you have a whole bag of cornmeal sitting idle in the pantry & you see an easy & quick corn bread recipe? You get inspired!! I had this whole morning to myself & i was browsing thru’ a book when I came across this recipe of Bob Beauchamp.. who says this bread reminds him of his grandmother who lived in the deep woods of East Texas- well that is not very far from where we live now! This bread needed no rising, so it would be ideal for the lunch which I had to cook. I decided to stuff in some potatoes in it. Then we had a fusion cuisine for lunch – Potato stuffed Cornbread, some fruit salad & some Tandoori Tofu:) (this one turned out really great, & I’ll be posting that soon). 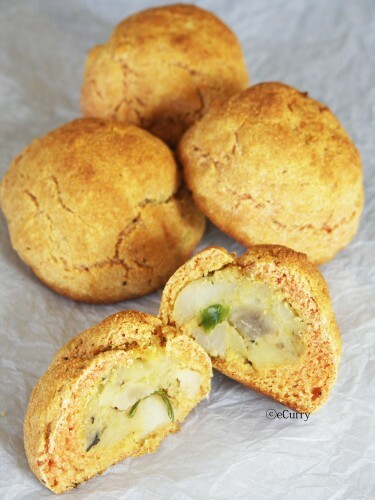 These breads looked a lot like the Aloo Bonda don’t they?. I did not make it in a loaf as the original recipe had called for… .since I used the stuffing, I just made small rolls with these. Boil, Peel & Mash the potatoes. Chop the onions in small pieces. Heat oil in a pan. Stir fry the Onions & Cumin till the onions are just starting to get brown. Combine the Mashed Potatoes, & Salt & stir till they are well mixed. Switch off the heat. & mix in the chopped Cilantro/Coriander Leaves. Set aside. Add Egg & little Buttermilk at a time to the above mixture to make a dough. If it requires less buttermilk, use less. (the amount of liquid required might vary with the kind of flour/meal). It will be more like a paste, not runny but slightly crumbly to feel. Preheat the oven to 450 degrees F. Grease a baking pan/sheet with Butter & keep ready. Take a fistful of this mix, & flatten it at the palm of your hands. Put about 2 tablespoons of Potato filling on this, & fold it to form a ball, so that the dough completely covers the potato. Set it on the buttered pan. Do the same with all the dough & the filling. I made about 7 – 8 rolls. Bake for about 20 minutes till they are Light Brown/Golden. I have never made corn breads before. These definitely had completely different texture & feel than the wheat bread that we are so used to having. And we loved it. The slighly crumbly, grainy texture did really well with the mashed potatoes inside. We ate a few for lunch, & refrigerated the leftovers..Sending these to the Bread Baking Day #17, the theme being Bread & Potatoes. Its hosted at Notite Van Lein. they do look so much like aloo bondas. And the fact that they are baked, I am sold. Potato stuffing in cornbread sounds intriguing…looks delicious ! arey! these looks so delicious ..very innovative to add potato stuffing inside..
tumaar Morocon Potato salad Ta dekhe jhibe jol eshe geche.. This looks lovely. I love stuffed bread and this should make a lovely snack for Soeren’s lunchbox! 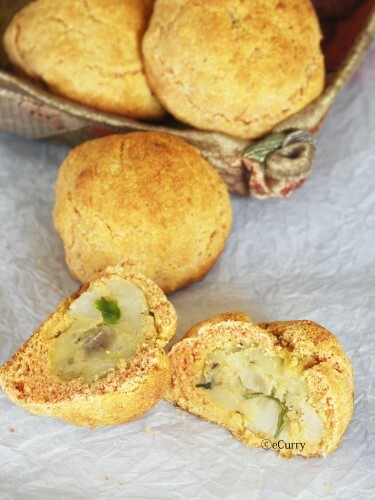 Love those potatoes inside the corn bread! What a great idea! Soma, this is very inventive and it looks yum! wow! Dearest Soma, you’re a genius! I bet this tastes fantastic! I’ve been eyeing up a cornbread recipe these days. will definitely make it, too! btw, what sort of cornmeal did you use? fine, medium, coarse? ta! I used Medium for this.. the coarse I find tough to work with, & the fine would give less texture. What a great thing you got inspired by cornmeal, these look so appetizing, a great roll to take on the road, or for lunch. Thanks for entering these rolls for BBD#17! This looks lovely !!! waiting for yr tandoor tofu post ! very innovative soma. looks yummy. 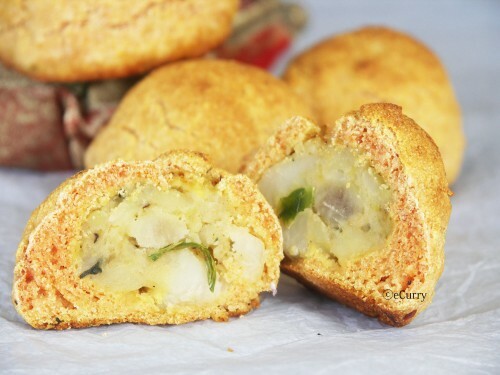 yeah sure these look like aloo bonda..but healthier with corn n whole wheat. amazing soma…in fact, I always like reading your recipes because they are so innovative! Wow tempting and alluring stuffed bread. Congratulations. You are a great winner HHDD25. Your recipes are wonderful. Thanks you for your commens and visit in my sweet blog. wow, what a great idea to stuff potato in a bread! looks gorgeous and mouth-watering. Cornbread and potatoes are satisfying staples and your picture more than satisfies!!!! It is delicious! Soma, these are so cute! I can imagine the look of surprise and happiness when you bite into one of these 🙂 And what a great accompaniment to a meat stew too. You are so teasing me here girl. Please send those to me 🙂 They look like Aloo Bonda to me a well. This and fruit sald, just yumm! You surely stepped it up a few notches, cornbread (yum, have not had this lovely bread treat is SO LONG) and spot on for the snaps too! This looks so easy… thanks soma for posting such easy recipes for people like me who are full time working moms – but love to expirement new dishes caus ei get bored with my own cooking !!! i so love cornbread. i will try this soon. First time here, I think. What a lovely recipe! Loved the idea of potato stuffing in corn bread. Very interesting recipe! Sounds and looks great. My dear I hope you know, this is genius! Great idea. I can taste these and my mouth is watering. A perfect snack and comfort food. Yummy! These sounds deliciously different! Yum! Oh, how did I miss this amazing bread? I saw you entered it for a chance to win a bread knife and I really hope you win it. It is an amazing tool! Good luck! I happened to chance on your blog today while searching for something interesting to bake…I just loved the idea of this bread as corn bread is one of my favorites. I have never made this eggless, however I usually substitute egg in baking with ground flaxseed. try combining 2 tablespoons ground flaxseed with 5 tablespoons water and let it sit till it thickens and gloopy. Use is as an egg substitute. Hope it works. alright im trying this out but the batter is nothing of a paste! its like a cake batter! Im adding more flour at the moment, but for next time any idea to prevent this? batter did not turn out as a paste for me either! tasted really bad. Try to use little buttermilk at a time until a paste is formed. The amount might vary (to make a paste) depending on the kind/brand of flour/meal. Sorry about it. I will update the post with instructions. The dough needs to be not runny and like a paste for it to hold the filling and stay in shape.